The Rolex Sky-Dweller combines supreme aesthetic quality with technological innovation, resulting in an ideal watch for travelers or those who are constantly on the move. 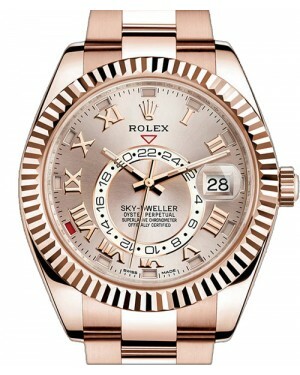 Its main features being the ability to keep track of time in two different time zones, through independent rapid-setting of the hour hand. 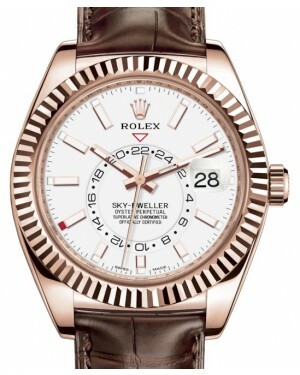 Additionally, the Sky-Dweller has a 42mm case size, bi-directional 'ring command' bezel, instantaneous calendar, a 24-hour display and a brand new Rolex 9001 self-winding movement. 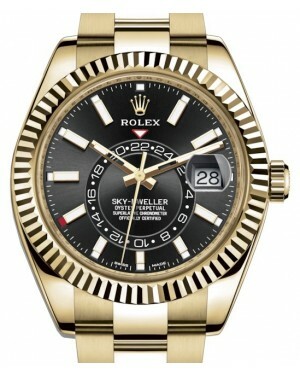 Thanks to its stylish appearance and range of functions, the Rolex Sky-Dweller is an extremely valuable timepiece and a status symbol that is sure to draw envious glances from those around you. 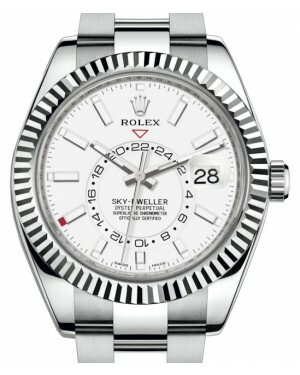 When it was first introduced at Baselworld in 2012, the Rolex Sky-Dweller created a significant buzz, because it was the first truly new watch model released by the brand for approximately 20 years, and one of only two new complications created by the manufacturer for around half a century. 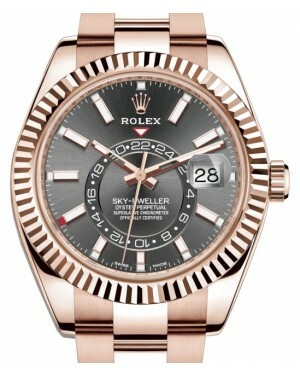 Marketed as a traveller's watch and benefiting from a sporty appearance, the Sky-Dweller is defined by the presence of both a rotating 24-hour disk, which displays a second time zone, a date display window, and a calendar mechanism, which enables the watch to display the month as well as the date. 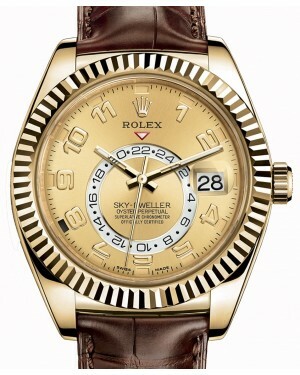 At the time of launch, the Sky-Dweller was available in three different configurations: an Everose gold model, with a brown alligator strap and a chocolate coloured dial (Reference 326935), an 18k yellow gold model, with a champagne dial (Reference 326938) and an 18k white gold model, with an ivory coloured dial (Reference 326939). Each of these models had a 42mm case size and was powered by the in-house calibre 9001; one of the most complicated movements made by Rolex for several generations. 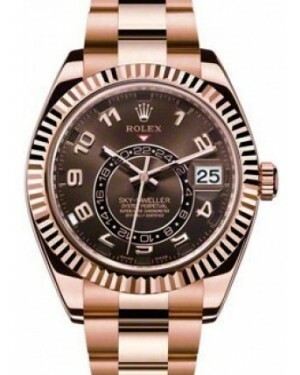 The movement itself has seven different patents, is COSC certified and is able to boast an impressive 72-hour power reserve. 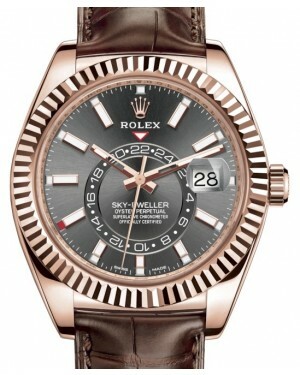 This first set of Sky-Dweller models attracted significant attention and established the collection's main functions, including its combination of date, month and dual time zone display. On the dial, the 12 hour markers also correlate to a month of the year, with the current month indicated by a small window next to that number. The first update to the Sky-Dweller collection came in 2014, when some alternative models were unveiled at Basel World. Among these new releases were a white gold model with a black alligator strap and black dial colour (Reference 326139) and a modified yellow gold version, this time with a brown alligator strap (Reference 326138). 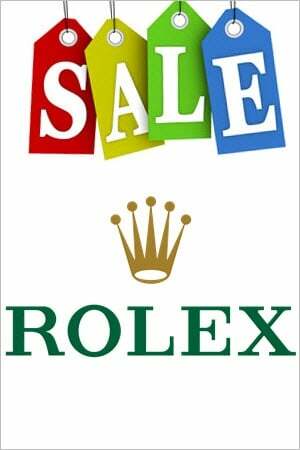 Nevertheless, the first major additions to the family came in 2017, with the release of two new 'Rolesor' two-tone models. 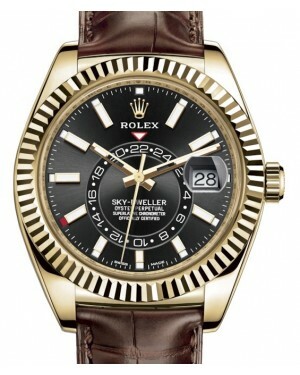 The first of these was a combination of 18k yellow gold and 904L stainless steel (Reference 326933), which was available with either black, champagne or white dial colours. The second combined 18k white gold and 904L stainless steel (Reference 326934) and was available with a selection of either black, blue or white dial colours. 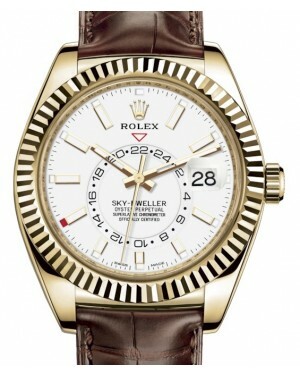 These models also marked the first major update to the Sky-Dweller's appearance, featuring new rectangular dial markers, improved legibility thanks to Chromalight display, and slightly longer hands.